They’re not in Oregon, apparently. Anyone else got some state-specific numbers? 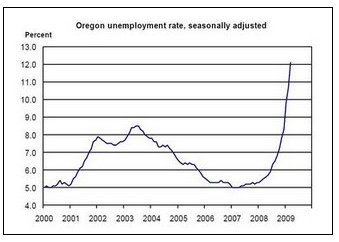 Oregon’s seasonally adjusted unemployment rate rose to 12.1 percent in March from 10.7 percent (as revised) in February. The state’s unemployment rate has risen rapidly and substantially over the past nine months, from a rate of 5.9 percent in June 2008. State of WA isn’t quite as bad as Oregon. It was at 8.4% at the end of Feb. Haven’t seen numbers for March yet. Florida is bad. Some loactions are double digit whaile the remainder are hovering just below that! I personally know people who have been looking for a job for about two years. One moved out of state and got a job within 3 weeks! I am seeking employment out of state even though I currently have a job. Some employers even take advantage of the situation (the beatings will stop when moral improves). Amica—“Employer Share purchase plan and Employee Stock option plan-YOU can be an owner of Amica. Our Success is YOUR SUCCESS” This is what Amica claims is a “benefit of employment”?? ?Then could someone PLEASE< PLEASE explain how Amica see’s this as a benefit when they posted a third quarter loss????? Well, obviously Michigan is in bad shape, at about 12%. If you want to work, you’ll have to move to a state that ends in Dakota. Nevada isn’t doing so well right now. I think we are closing in on 9% last I checked. Mainly because people don’t gamble in economic hard times.